Students will learn one of the methods used to knit in the round: magic Loop, aka “traveling loop”. If you’ve never knit in the round, or find using DPN’s to be too fiddly and frustrating, this class is for you. With this method, you will be able to knit socks, mittens or sweater sleeves using a pair needles you probably already have on hand. This method is ideal if you are traveling with your knitting as well. We will also go over how to join your knitting in the round on both magic loop and short circulars to avoid common problems. must be comfortable knitting back and forth; no experience knitting in the round is required. hands-on instruction; this is a technique-oriented class, so no specific project is included. 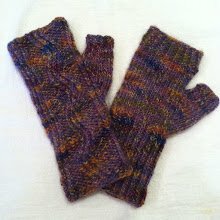 Photo shown is of a pair of fingerless mitts knit using the magic loop method. A set of circular needles (fixed or interchangeable) with a 32” or 40” cable, in the appropriate size for your yarn. Cable must be flexible - Dreamz, Addi’s, ChiaoGoo and Hiya Hiya brands are all good. To sign up for this class, please register through the website, or call the shop to be added to the list - registration fee goes to the shop, and the class fee is paid directly to the instructor via check or cash at the time of the class. If you are unable to attend, please call the shop no later than 48 hours prior; otherwise, registration fee is non-refundable and non-transferable. This class has a 3-student minimum; if minimum is not met 48 hours prior to class, registration fee will be refunded, and student has the option to register for class at a later date, or contact the instructor for a 1-hour private lesson ($30/hr) by appointment. Instructor reserves the right to refuse future class registration to those who no-show for a class. $30 for class - $5.00 is for registration fee only; balance ($25) to be paid to instructor directly.